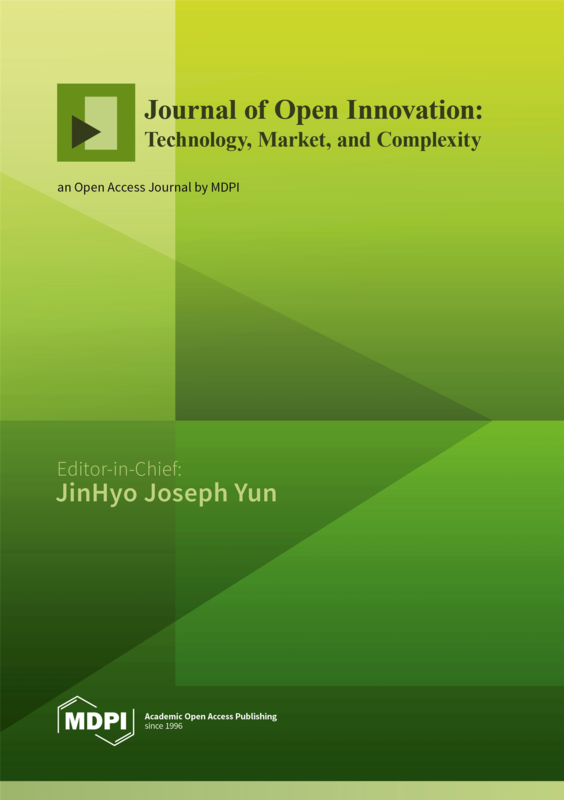 Journal of Open Innovation: Technology, Market, and Complexity (ISSN 2199-8531) is an international, scientific, peer-reviewed and open access journal on the open innovation, open business model, entrepreneurship, complexity, and evolutionary change in the economy published quarterly online by MDPI as of May 2018. The Society of Open Innovation: Technology, Market, and Complexity (SOItmC) is affiliated with JOItmC. * MDPI has been publishing JOItmC from 1st May 2018. The submissions can be sent directly to the MDPI submission system, including for special issues, as of 1st March 2018. Rapid publication: manuscripts are peer-reviewed and a first decision provided to authors approximately 18.9 days after submission; acceptance to publication is undertaken in 9.4 days (median values for papers published in this journal in the second half of 2018). High visibility: To be indexed by Scopus from Vol. 3 (2018). This study investigated the relationship between open innovation and the radicalness of innovation. The balance between radical and incremental innovation is an essential part of the ambidextrous use of explorative and exploitative strategies, and this study assumed that open innovation is usually interlinked [...] Read more. The aim of this paper is to attempt to understand why the popular academic and policy field of promoting, studying and evangelising “entrepreneurship” should have been associated with great success but, in the past twenty years or more in many advanced economies, so [...] Read more. A supporting management discipline is an under researched phenomenon. A majority of firms’ operating capabilities relating to knowledge, innovation and technology management as a supporting management discipline. This paper reviews the literature in the research and development (R&D) domain to formulate and propose [...] Read more. Despite a growing interest in the effects of arts-based interventions on organizational change, concepts aiming at business innovation and product development other than residencies are rare. Furthermore, little is known about the role and impact of artists involved in idea-generating formats. How does [...] Read more. The role of venture capital as mediator and gatekeeper is well acknowledged and geographical barriers for open innovation have been questioned, but venture capital firms’ distant investments have been investigated only rarely. The strategic benefits accrued from corporate venture capital (CVC) investment depend [...] Read more. To gain the potential benefit of autonomous intelligent systems, their design and development need to be aligned with fundamental values and ethical principles. We need new design approaches, methodologies and processes to deploy ethical thought and action in the contexts of autonomous intelligent [...] Read more. Culture is a key driving force in enhancing organizational performance. The results of recent studies indicate the importance of managers having the capacity to understand organizational culture and link it to organizational performance improvement. This study aims to examine the relationship between organizational [...] Read more. Integrating the relational approach and social exchange theory, the authors conceptualize the quality of leader‒member and team member exchanges as mediators for understanding the role of transformational leadership in employee proactive behaviors (e.g., voice, taking charge, and innovative behaviors). The results based on [...] Read more. Changes in workplace demographics in the oil and gas industry have raised a concern about the risks of a knowledge-loss crisis due to mass retirement. The industry response has often consisted of strategies aimed at mapping knowledge across organizational units, codifying knowledge in [...] Read more. In the last few years, the monstrous fan has gained attention in this country for large space buildings and areas. The continuity of this product technology is important to allow it to be able to survive in the current and future market. However, [...] Read more. Public R and D management agencies have been taking on key roles in the national R and D ecosystem. The purpose of this study is to suggest ways to improve the operational efficiency of public R and D management agencies based on analysis [...] Read more. Despite the widespread agreement on the importance of dynamic capabilities to the success of mergers and acquisitions, little is known about how these capabilities may contribute to the business model’s innovation of an acquirer. The purpose of the paper is to clarify the [...] Read more. This paper considers a carbon emission cap and trade market, where the carbon emission cap for each entity (either government or firm) is allocated first and then the carbon trading price is decided interdependently in the carbon trading market among the non-cooperative entities [...] Read more. This research is to analyse the existing cooperation between universities and the construction industry and to investigate what is the most effective model for long-term cooperation between an academic university and the private construction sector. The current article describes the human resources management [...] Read more. Business model dynamics is important, because high-tech companies, the technology that they commercialize, and the market in which they operate all change over time. We build on the dynamic capability view of the firm to explain business model evolution and innovation, looking particularly [...] Read more. Open source software and open innovation are an important resource for today’s industries. Communities collaboratively create different kind of publicly available value, boosting innovation and also technology. However, whereas this value is generated and captured by various involved parties, the outcomes are, in [...] Read more. We proposed and created a methodology to solve a real-world problem, which is a special case of the generalized assignment problem. The problem consists of assigning drivers to harvesters, which will then be assigned to harvest sugarcane in order to maximize daily profit. [...] Read more. Non-ferrous metals are widely used as basic materials in various industrial fields, and zinc is a metal that is produced and used next to iron, aluminum, and copper. In this study, DEA (data envelopment analysis) was applied to measure the efficiency of 43 [...] Read more.